Reading Between the Lines Set Two is a sequel to the popular Reading Between the Lines. 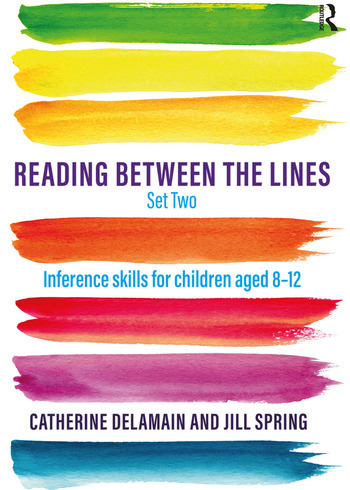 It is a resource book for teachers, teaching assistants, SENCOs and Speech and Language Therapists who need to support the development of inference skills in children aged 8–12. These unique guides offer accessible and easy-to-use material specifically targeted to improve inference, which is a crucial element in understanding spoken and written language. The book provides 370 engaging texts themed around different areas such as place and occupation, and includes short stories about everyday events, magic and adventure. Each short text is accompanied by guiding questions and is carefully graded to allow students to gradually progress from more simple texts with highlighted clues onto more challenging scenarios which will require higher level inferencing skills. Containing handy photocopiable material, this guide can be used with whole classes, small groups or individual children. It will be particularly valuable to professionals working with children who have Autism Spectrum Disorders or Speech, Language and Communication Needs, who need particular support with inference as they develop their broader social communication skills. Catherine Delamain is a retired Speech and Language Therapist with over 40 years’ experience working with children with Speech, Language and Communication Needs in clinics, schools, special schools and nurseries. She spent several years in association with a Senior Educational Psychologist lecturing to teachers on how to address the needs of children with Speech, Language and Communication Needs in mainstream and special schools. With Jill Spring, she is the co-author of eight books published by Speechmark. Jill Spring is a retired Speech and Language Therapist who specialised in child Speech and Language Disorder and Autistic Spectrum Disorder. Since qualifying in 1972 she worked in a variety of paediatric settings including community clinics, assessment centres, opportunity playgroups and mainstream schools. From 1996 to 2014 she worked in specialist language units attached to mainstream schools, spending two years managing one of these units. Before retiring in January 2016 she was responsible for coordinating the Education Commissioned Communication Plan support service for children with complex speech, language and communication difficulties. She also worked as part of the multi-disciplinary team responsible for assessment and diagnosis of Autistic Spectrum Disorders in West Dorset.